Lily Saito for 'Dancers and Dogs'. Photo by Ian Kreidich and Kelly Pratt. If one were to envision dancers at work, a dog might not necessarily be there. Dogs can be time-consuming and expensive, and just imagine getting fur all over costumes. Yet both dancers and dogs typically abound with physical energy, curiosity and love for life. It’s a connection that’s part of the special bond between a human and his/her best friend. Dancers, just like all people, most likely treasure the cuddliness and love that dogs so willingly give. Ian Kreidich and Kelly Pratt. Ian Kreidich and Kelly Pratt are full-time freelance photographers who specialize in dance photography. In January 2017, they had an idea to shoot dancers and dogs together – and the project, Dancers and Dogs, took off from there. They were interested in seeing how mixing the elegance of a dancer with the silliness of a dog would work on camera. They thought it might be a fun, intriguing challenge. Here, Dance Informa speaks with Pratt to learn more about the project – how it started and grew, what the creative process is like, and how it might develop from here. Kreidich and Pratt have worked extensively with St. Louis Ballet, and the first dancers for the project were a few dancers in that company. By March of 2017, they had assembled enough great shots to make a Facebook video ad for the new project, which went viral — viewed over 25 million times. This made Pratt incredibly pleasantly surprised, she says, and she realized that the project could really be something great. Since then, articles about the project have appeared in the London Evening Standard, Insider, People Magazine and many other publications worldwide. The photographer pair has shot dogs and dancers from all over the U.S., including Master Ballet Academy (Phoenix, AZ), Orlando Ballet, Nashville Ballet and Big Muddy Dance Company (St. Louis, MO). Particularly meaningful for Pratt was working with American Ballet Theatre – her “dream company” to shoot, she says. Pratt and Kreidich have also worked with individual dance artists, apart from contracted company dancers (such as Bianca Bulle and Ashley Lew), in Los Angeles and other cities. “We mainly work with ballet dancers but also sometimes shoot contemporary dancers,” Pratt explains. ‘Dancers and Dogs’. Photo by Ian Kreidich and Kelly Pratt. As for the dogs, Pratt shares how sometimes they’re the dancer’s pet and sometimes they aren’t. She explains how they’ve had a variety of temperaments and training levels in the dogs they’ve worked with, but at the same time there are minimum requirements; dogs need to be able to sit or stay with owners about five feet away, as well as be comfortable in their own skin, comfortable with new people touching them and comfortable in a studio environment, which is “somewhere many dogs haven’t been,” Pratt says. “But I would never want to put a dog in a situation where he or she is terrified.” The photographer pair aims to do one outdoor shot in every location they visit. That type of setting can bring more stimuli, making it harder for some dogs to stay focused, as well as more unpredictable factors overall. On the more trained end of the spectrum, she and Kreidich also worked with The Super Collies, a group of trick dogs who were on America’s Got Talent. They also aim to shoot a variety of breeds. “We don’t want to shoot all purebreds,” Pratt asserts. Whatever the breed, and whomever the dancer, they look for that “spark” of connection between dancer and dog — that moment when the special type of love between canine and human kind is clear. Pratt describes how the best shot can be the “outtakes”, when something happens that wasn’t intended to happen but when that spark of connection between dancer and dog is clear. 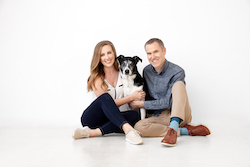 In another conscious vision beyond the photography project, Pratt and Kreidich have engaged in initiatives to help get shelter dogs good homes, as well as raise awareness of the issue of overcrowded shelters and the constant high number of dogs who need a loving family to care for them. They produced the “Muttcracker” last year, for instance, an event showcasing adoptable dogs. With all of this accomplished in such a short time, Pratt is pleased and proud of what the project has become in two years – particularly in gaining nationwide recognition, she affirms. “Doors of opportunity have opened, so now the question is ‘where do we go from here?’” she says. Pratt describes working with a learning curve, as no one’s ever shot this particular subject matter, and she and Kreidich aren’t — per se — animal photographers. Yet she feels that “now, having done this work for two years, we can totally do that,” she shares. The photographer pair wants to keep working with new dance companies and independent dancers, and eventually to produce a book of work from the project. “We never really know who will want to partner, or what could happen,” Pratt affirms. 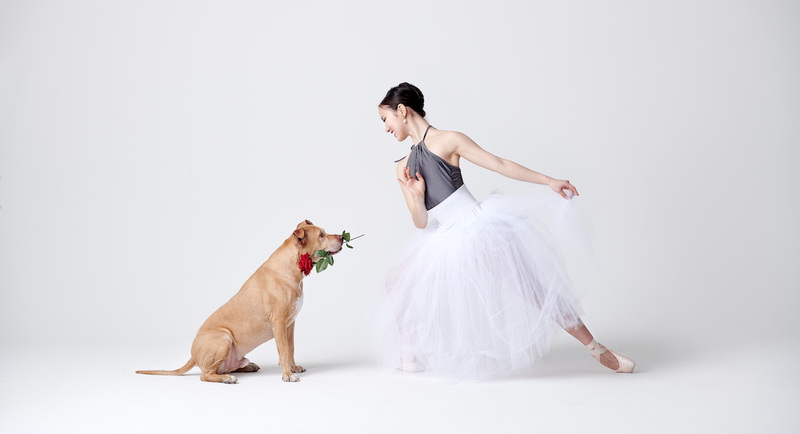 For the time being, every shoot with dancers and dogs can bring new possibilities and new joy. For more on Dancers and Dogs, visit dancersanddogs.com.